Unfortunately for the viewing public, the Raptors beat the Bucks handily in Monday night’s pivotal game 5. It would be surprising if they didn’t win the series, meaning we, as a nation, will be subjected to at least four more games of slow, iso-based, boring possessions that end in a Demar Derozan mid-ranged jumper, a Kyle Lowry miss, or a forced Serge Ibaka 3. It’ll be great watching them fail miserably against Cleveland. Just great. But, while everyone else is watching the visual-Ambien that is Toronto Raptors basketball, I’ll be paying attention to one man- Jonas Valanciunas. It’s taken a lot of hard investigation and dangerous undercover work, but I’m just about ready to go public with his exact role in the NBA’s Eastern European crime syndicate known as The Drazen’s Head. Never heard of them? Consider yourself lucky. Just hearing the name of the organization is enough to put your life at risk. It’s only a matter of time until Pero Antic shows up on my doorstep. What’s their racket? Drugs? Weapons? Gambling? Human trafficking? Fundamentally sound passing? A little bit of everything, if we’re being honest. They’ve terrorized the NBA underworld for far too long, and it’s about time someone blew the lid off this thing. I’ve spent years of my life infiltrating their ranks and earning their trust, and it’s time I release my findings. It’s a complex hierarchy, but I’ve managed to meet almost every noteworthy member of the Drazen’s Head. Vlade Divac- Who else could it be? What’s the old saying? “The greatest trick the devil ever pulled was to convince the world he didn’t exist?” Well, the greatest trick Vlade ever pulled was to convince the world he was an idiotic buffoon incapable of intelligent thought or decision making. You can believe Vlade to be the bumbling GM of the Kings who would trade DeMarcus Cousins for Buddy Hield, but I know the truth. I’ve seen the real Vlade. Born on the war-torn streets of Serbia (to save myself some time, just assume everyone from here on out was born on war-torn streets), he was raised by violence. He was always destined for evil, but his size, strength, and, above all, his intellect quickly brought him to the top of Yugoslavian organized crime. When he moved to the U.S., it was time for him to start his own family. It started out small-time, but as the NBA grew more international, his influence grew. As ruthless as he is smart, the chaos that surrounded him in his early life gave him a insatiable desire for control. Even though the Drazen’s Head has expanded exponentially over the years, he still has a hand in everything. No decision is made without his approval. And if you cross him? Well, just think about what happened to Andris Biedrins. And, of course, as a respected crime leader, he never goes anywhere without his bodyguard. Nikola Pekovic- Besides the obvious- size, brute strength, intimidation factor- no one is quite sure how Pekovic rose to such a prominent role in the organization. He’s not particularly smart of business-savvy. What separates him from the other muscle that makes up the majority of the Drazen’s Head’s ranks? Does he have dirt on Vlade? Not likely. Vlade is too careful to allow someone like Pek to blackmail him. My thoughts? It’s pretty simple: he’s resourceful and Vlade trusts him. He knows he can control him and he knows he has Pek’s undying loyalty. So, despite coming to the NBA twenty years after Vlade and being little more than an elevated grunt, there he is at the top of the Drazen’s Head. He’s at every big meeting. He’s with Vlade for every big decision. He helps move product. He helps collect debts. He’s an intimidator and an enforcer and, in Vlade’s eyes, one of the most important members of the Drazen’s Head. Don’t let his looks fool you. If you go in to an encounter with Pek without a precise plan of attack, he’ll destroy you. I’ve seen what he does to Vlade’s enemies, and friend, you don’t want to be on the other end of it. Peja Stojakovic- When Peja was hired by the Kings to be the GM of their D-League team, no one batted an eye. He’s a legend in Sacramento and BFFs with Vlade, after all. But I knew the real reason Vlade needed his old running mate close-by. Peja has served as Vlade’s right hand man since the moment the two met. 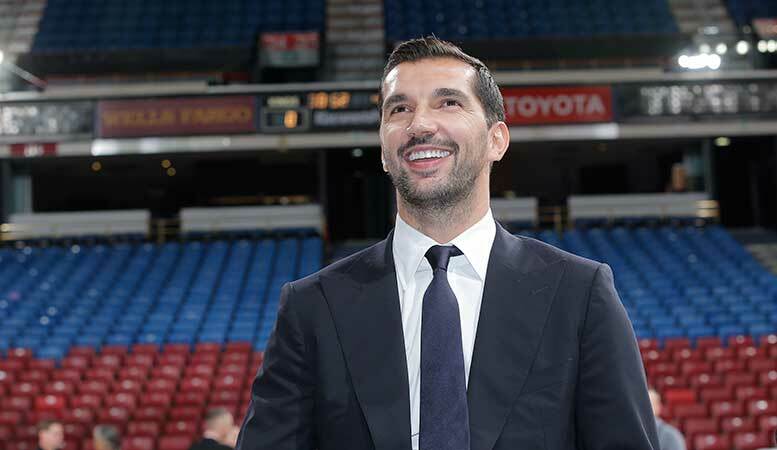 Peja has the perfect personality to serve as the consigliere to the Drazen’s Head leader- he’s patient, quick on his feet, wise, and always knows how to walk Vlade off the edge. Many people owe their lives to Peja convincing Divac to spare them (only if it benefitted the Drazen’s Head, of course). Most importantly to Vlade, though, is the fact that Peja is unambitious. Much like his playing career, Peja is just fine being the second or third option, so Vlade knows he has nothing to worry about from his most trusted advisor. He consults him on just about everything, from who they should blackmail to where he should eat lunch. Nikola Jokic- It wasn’t supposed to be this way. Much like Michael at the beginning of The Godfather, Jokic was supposed to be the one that went legitimate. But circumstances change, and now he’s flying through the Drazen’s Head ranks with record speed. It’s no mystery why, either: Vlade sees himself in Jokic. He has the same business acumen, the same strategic genius, the same ambition to become more than the situation he was born into. It’s not uncommon to see Vlade take Jokic with him to big meetings so he can see how the business truly operates. 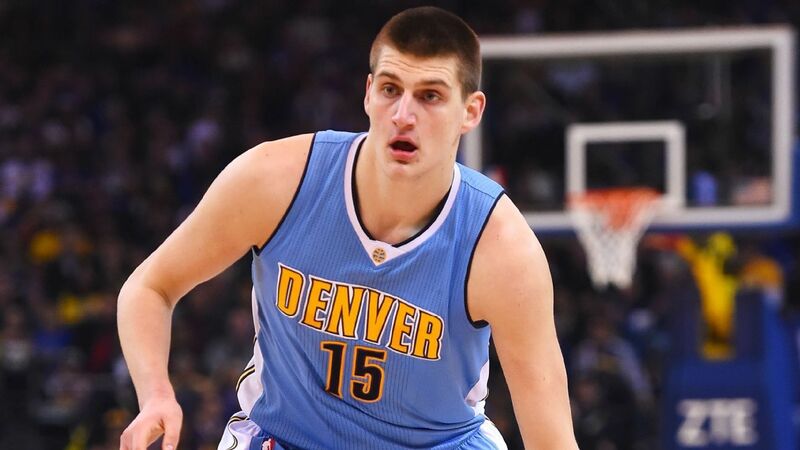 There’s little doubt of where Jokic’s future is headed. The only question is, when it comes time for him to be the head of a crime syndicate, will he start his own family or try and take over the Drazen’s Head. I just hope he doesn’t underestimate Vlade. Pero Antic- The ultimate eraser. If Vlade wants someone dead, the Macedonian Monster usually doesn’t waste too much time. I’ve had the great fortune of never meeting him in person, because the list of people who have and are still around to talk about it starts and ends with Vlade Divac. All the information I have on him is solely based on whispers and hearsay. Some say he’s never missed a shot. Some say he once killed five men in a minute with nothing but a gardening shovel. Some say the sun sets because it’s afraid of seeing what he’ll do at night. Some say he served as the main inspiration for John Wick. I say if you ever hear the name Pero Antic you run as far in the other direction as possible. Zydrunas Ilgauskas- Obviously, since the Drazen’s Head is, at its core, an Eastern European organization and do much of their business there, they need someone watch over their overseas holdings. That’s where Big Z comes in. In the absence of Vlade, he’s responsible for making sure they remain a well oiled machine. That involves overseeing production, arranging transportation of both men and products, serving as a dispatching officer for the many members of the Drazen’s Head who are no longer in the NBA, and making sure no one forgets that Vlade is always watching. Sure, Z might seem like a slow, lurching, Frankenstein-esque science experiment, but that’s because he is. He’s also fiercely loyal and wouldn’t even consider making a decision without consulting Vlade. Known to randomly kill one Drazen’s Head member with his bare hands a year to keep up appearances, Z essentially serves as a vassal for Vlade’s indomitable will and is willing to do anything to stay in his good graces (and to keep his position). 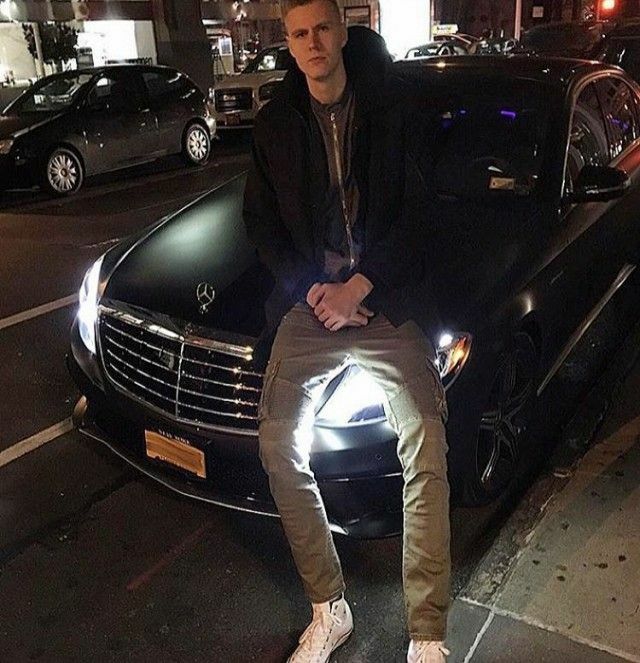 Kristaps Porzingis, Sasha Pavlovic- Watch any show or movie about the drug trade and you’ll notice there’s always a younger guy doing a lot of the ground work- moving product, recruiting new blood, organizing deals, and keeping an eye out for the law. These two are the head Young Guys for the Drazen’s Head, with Kristaps taking over the main U.S. operation and Pavlovic moving to Europe. Sasha was Vlade’s first runner when he first came to the NBA, but within a few years the culture gap limited how much action the Drazen’s Head could really get in the league. But, since he still looks exactly the same (i.e., like every young Eastern European mobster ever), he resumed his same duties when he went back to Europe, and, needless to say, is doing very well. Kristaps fits the role perfectly. As a guy who spent much of his childhood with cornrows and has pretty much dropped his accent to pick up a Brooklyn one, he’s more…relatable than most other members of the Drazen’s Head. Add in his influence in New York City and you have a very valuable member of the organization. Drazen’s Head business has soared in the short time Kristaps has been in America. The other players around the league find him likable, and it gives him an inside track to fulfilling their recreational needs. He’s recruited countless new runners and dealers, and is beginning to establish himself among the higher ranks of the Drazen’s Head. The only thing that could hold him back is the lack of a mean streak. Sarunas Jasikevicius- Every criminal organization has a driver. He drives the getaway car, pilots the private jet, steers the boat, flies the helicopter, you name it. A grease monkey who has earned Vlade’s complete trust, Sarunas handles all of the Drazen’s Head’s transportation needs. To eliminate middle men, Vlade sends him to Europe with the Drazen’s Head’s custom plane every time they need to bring something over to America. He’s Vlade’s chauffeur. He’s evaded the police so many times he can do it in his sleep. He can drive (and fix) anything. He’s not much of a thinker or a bruiser, but not everyone can be the kingpin. Andrei Kirilenko- Just about the only place on Earth Vlade Divac is hesitant to tread is Andrei Kirilenko’s lab. The Drazen’s Head’s chief chemist and weapons engineer, Kirilenko is responsible for just about all of their movable product. Never satisfied and more than willing to use himself as a test subject, AK47 is a true mad scientist. During his career with the Drazen’s Head, he personally claims four of the five deadliest heroin outbreaks in U.S. history as his own creation. Recently delving into meth, Kirilenko’s lab has become dangerous for only the most cautious and cognizant. Earning his nickname long before choosing to wear number 47, Kirilenko is also a weapons and explosives expert who has thirteen different patents on 9mm handguns alone. He’s a bonafide genius and master gunsmith, as well as a world-class marksman. You’d think someone like this would have more power, but the eccentric Kirilenko much prefers his lab toys to the company of others, and is far more concerned with his next invention than making money for the organization. Jusuf Nurkic and his dad, Marcin Gortat- If you’ve ever seen an NBA player of Slavic descent, you know that the vast majority of them fall into the ranks of the Drazen’s Head’s most abundant resource- hired muscle. From Miroslav Raduljica to Rasho Nesterovic to Jake Tsakalidis to Boban Marjanovic, the Drazen’s Head is rife with huge, hulking strongmen who can rip a man in half with their bare hands. Many contribute the Drazen’s Head’s rise to the brute force and intimidation of most of their foot soldiers. They’re the ones collecting debts, delivering packages, and spreading fear in the name of the Drazen’s Head. But despite their loyalty to their leader, surely Vlade can’t monitor his troops 24/7. Who enforces the enforcers? Well, after a nearly successful coup was lead by former Drazen’s Head goon Zaza Pachulia (I’ll spare you the details on why he’s a former member), Vlade decided to appoint two generals to act as governors and ombudsmen in his stead. His first choice was a seven foot, 400 pound Bosnian riot cop who once beat up 14 men at once. It just so happened that Hariz Nurkic had a son in the NBA. Forming the ultimate fire and ice duo, Hariz, the stoic, immovable golem, and Jusuf, the brash, immovable braggart, the Nurkic Boyz are some of the Drazen’s Head’s most powerful weapons. Capable of defeating an entire battalion by themselves, no one dares cross them. They earn the respect of their underlings with one stern look, and have even contributed some useful ideas from time to time. They employ absolutely brutal tactics against their enemies. Speak to them at your own risk. 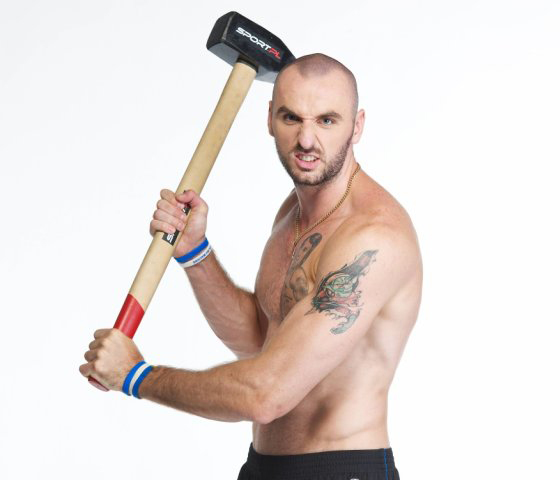 His second selection was the Polish Hammer, Marcin Gortat. Where the Nurkics’ earn loyalty out of fear, Gortat earns it out of devotion. A father to his men, Gortat is quick with a joke or a helping hand, but is always the first one in the fray when something needs to be done. He leads by example, and has no problem getting in one of his men’s faces and ripping them a new one, because he knows he can build them back up stronger than before. Even the business owners he holds up for payment rave about him. He has no doubt extended his time at the top of a dangerous game thanks to his new toy, Przemek Karnowski. Jonas Valanciunas- For years, I paid no mind to Jonas. I just thought he was more muscle. After all, the only times I saw him he was leaving the scene of a hit or shootout. With so many other power players, why concern myself with yet another huge goon? Well, I started to notice something when I never saw him with any of the other guys. He never ate with them, never drank with them, nothing. I asked a couple of guys about him and they hardly knew his name. 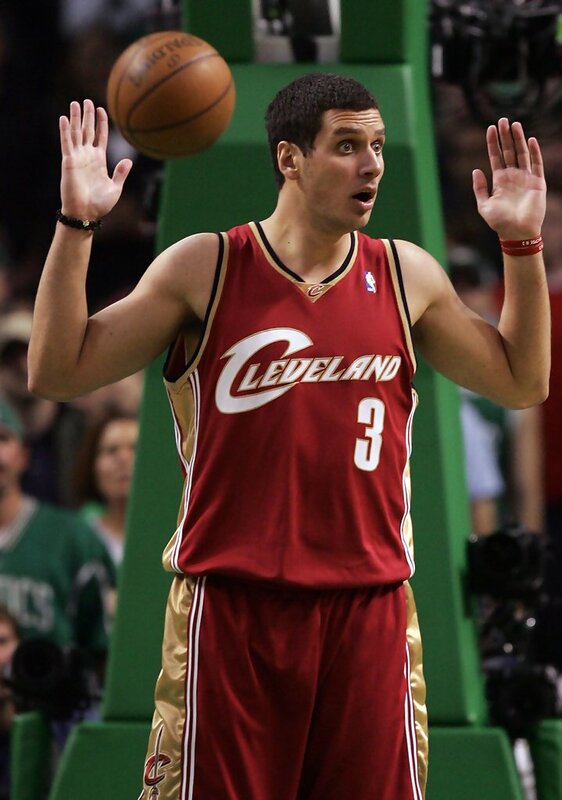 Having infiltrated pretty deep into the Drazen’s Head at this point, I knew he was the last piece of the puzzle. The last mystery to be solved. Acting on a hunch, I went with a party going to take out an important member of a rival gang. My first such mission, I decided to feign an injury so I could sit and observe. We lost the element of surprise quickly, and a firefight broke out. Just as quickly, it ended when Boban went on a rampage and destroyed everything in the house and mutilated the bodies of our mark and his associates. Almost on cue, Jonas entered the room. Everyone fell silent and started to leave. He looked around the room, then looked at me. He gave me a nod that said “either leave now or be prepared to help me do whatever it is I’m about to do.” I didn’t waste any time hightailing it out of there. The next day, I went back to the house and found no trace that we were even there. The furniture was replaced, the bullet holes were filled, the bodies were gone, the blood stains removed, it was a modern miracle. There wasn’t even a note in the paper about the deaths. I have absolutely no idea how he did it, but he made everything disappear. I went on three more of these missions and every time it was the same thing. We’d go in and shoot up the place, he’d come in and clean it up. It’s magic, the speed at which he works. I can’t imagine how much money and headache he’s saved the Drazen’s Head by eliminating legal problems before they begin. At great risk to my own safety, I was able to look at the Drazen’s Head’s payroll, and a mysterious entity known only as “JV” was the fourth highest paid member. The lower ranking guys I talked to about it were dumbfounded. Even the most in-the-know couldn’t figure it out. Well, I think I understand it now. And it’s definitely money well spent. It feels good to get all of this off my chest. The results of a lifetime spent undercover for one of the most dangerous crime syndicates in the world. Fear not, I used an alias, so it might be a while until they trace this back to me. Their technology is still from the late 90s, and I’m not sure if they have access to Google yet. To be safe, I burned all of my adidas track suits, random Serbian league soccer jerseys, Drakkar Noir, and gold chains. Depending on how quickly the FBI moves, I may have to go into witness protection. Only problem is, I’m not sure a government safe house could protect me from the Macedonian Monster.